As you may have read earlier, Sol went in Monday for what we believe to have been her first dental cleaning. She also had the growth removed from her eye. Additionally, she had a skin tag removed from her knee. We were prepared for all of the little “extras” of the procedure. However, we were somewhat surprised to learn that the vet discovered a tumor in her mouth during the routine dental procedure. They removed the top piece of what they described as a “wart”. Since this oral growth was of particular concern, a biopsy was performed. The eye growth and the knee growth were not bothersome to the vet and those did not warrant a biopsy. 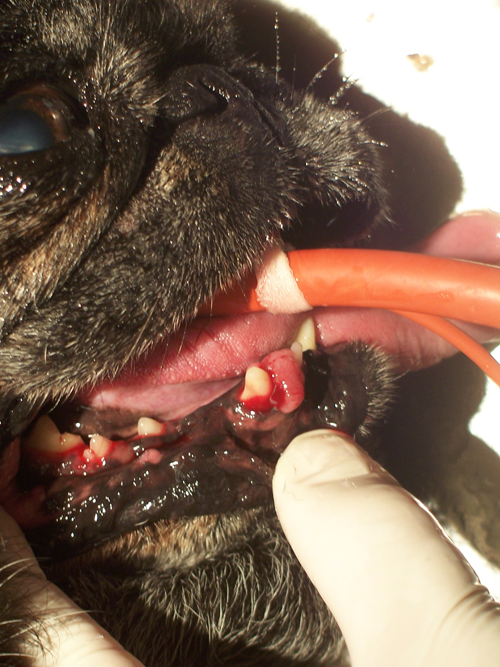 The vet tech described that these types of mouth warts are common in dogs and that while they can be cancerous, they generally are no big deal. She told us to expect the results within 7-14 days. Waiting a week to two weeks seemed like an eternity until today. The results came quickly. I would have waited the 2 weeks to find out this news because unfortunately, the results were not good. It is Pappillary (verrucous) Squamous Cell Carcinoma. Cancer. The good news is that it is considered a low grade malignancy. While the vet referred us to a specialist, they mentioned a couple of options. These were aggressive vs. non-aggressive treatments. The aggressive would be to remove the tooth in front and behind the tumor and the entire tumor which would likely include a significant piece of the mandibular (jaw) tissue. The “problem” with this is that this type of cancer will reoccur and even if we took care of it, it would come back. The non-aggressive treatment would be to simply monitor her bloodwork every 6 months to see how her lymph nodes are functioning and perhaps the cancer is such a slow growing variety coupled with the fact that she is already 12 years old she would not really be affected for the rest of her relatively short remaining life expectancy. The “problem” with this solution is that we feel like we are “doing nothing” because we would be doing next to nothing. We will of course consult with the specialist and determine which treatment plan to follow. The specialist is “conveniently” located adjacent to Luna’s eye vet. So, at least we are familiar with the area and while it is not “close” (about 50 miles away) we are due to bring Luna, Sol & Henry to the eye doctor soon. We’ll just double up the appointments on the same day. There is a particularly sad irony to all of this. It has been barely a year since Sol’s Grammy here in Florida was also diagnosed with oral cancer, received major surgery, had radiation and is just beginning to feel the benefits of being on the road to recovery. As I sit here I am still in somewhat of a denial filled fog. I just have to ask, “what are the odds that your mother and your dog both are diagnosed with oral cancer within a year’s time?” The quick response to that when asked aloud was, “well, obviously better than winning the lottery”. Too true. Needless to say, there were some tears shed in the OBP household tonight. Between reflecting on the last year dealing with human cancer and imagining the upcoming year dealing with puggy cancer, the emotions got the better of us. Albeit temporarily. We have hope for a positive outcome. We will grab that cancer bull by the horns and fix poor little Sol as best we can. She made it our way for a reason. The reason now is crystal clear. We are here for her. She has a forever home filled with love and support. For the curious, here is a picture of Sol’s tumor. They took it while she was under for her dental. I am so sorry to hear you are dealing with bad news. Lately it feels like a black cloud is hanging over everyone. Thank you for including the picture so we know what to look for in our own kids. We will continue to pray for all of you for peace and recovery. Oh, poor sweet Puggy! But Sol is so lucky to have gone wandering in a neighborhood where people knew you would take her in and love her. I’ll be keeping my fingers crossed that everythign works out ok with her and continues to be good for your mother too!! Keep us posted, I start every workday with a Puggie update! New week I go to visit my folks in New Smyrna Beach and will miss the updates! I’m so, so sorry to hear about Sol and this must have been terrible news for you to hear. But this shows that Sol came to you because there could not be a better person to advocate for her and find the very best treatment, whatever that may be. Sol knows how much you love her and that she is a very lucky pug to have you to care for her. You can be sure that good wishes and prayers are coming Sol’s (and your!) way. I will pray my hardest for the best possible outcome and for peace to fill the OBP house while this difficult situation must be solved. Sol couldn’t be in a better home to tackle this obstacle she must face. It is clear she is a fighter and I am confident she will, again, successfully overcome this new battle. Please know you all are in my daily thoughts, prayers, and in my heart. We are shedding tears for you as well. Cancer is scary. I’m sorry that you’ve had two family members affected in the last year; but good news that Sol’s Grammy is on the road to recovery. You will consult the specialist for Sol and you will make the best decision for her. She did find her way to you for a reason. Not only to have the best retirement home , but to be loved and supported beyond measure when she needs it the most! Good luck and we’re cheering for Sol too. We’ll be thinking about you all! I’m so sorry that this was the result you had to hear. We will be thinking all positive thoughts in helping the OBP household get through this. Big kisses for the ole’ gal. I truly don’t know what to say, except I know you give little Sol the very best of what she so truly deserves. I will continue prayers for you and her. God bless you. Just looking at all of Sol’s pictures you’ve posted, I’ve always seen such a peace in her. You know she is exactly where she’s meant to be, no doubt. And she know’s she is very well taken care of. She is certianly on my heart and in my prayers. As tears fill my eyes and my heart feels heavy, I know the LORD is looking over sweet little SOL and your family. SOl couldn’t be in a better place-it’s as if GOD himself picked you out for her to be with! Thank you for posting the picture so we can all be aware of what this cancer looks like. Sending the OBP home Peace & Prayers! We are truly sorry as well. Please know we’ll be praying for you and the whole family too! Oh My… It is hard news to read about. It is good to hear that OBP Grammy is on the road to recovery, but it has probably been a difficult year. Sol arrived to the OBP household for a reason, perhaps reasons we won’t know why. She needs you, and we all need her. I think along the way she will be teaching OPB readers a life lesson. I hope that further appointments will go well, and we shall all be waiting for up-dates. The vet photo is very helpful, and will probably alert us pug mommies & daddies if we see anything like it in our own babies. Poor Solly (I just have a hard time thinking of her as Sol, because we have so many old men here named Sol, lol) But, as her name implies she is bright and strong like the sun and will surely overcome this, too. Biscuit and Rascal sent puggie kisses to all of you, as we send prayers upward. Man, I don’t have anything new to add to all the great posts, but I certainly send my love and prayers to Sol, and the OBP family. I hate that this is happening to sweet little Sol and to the family. But I so agree that God has great plans for Sol and that she is part of your family for a reason. I think she will be teaching us all about love, compassion, patience, and peace. All of you are in my prayers. Sleighbelle will get an extra hug and kiss tonight for sure! I am truly crushed, my eyes are welled with tears. My heart goes out to all of you in the OBP home and thoughts and prayers are with you, as well. Sol was sent to you because you are the best folks for this caretaking and I know she’ll be in the best possible hands. Please take care and know that you are loved, Miss Solly! My heart goes out to all of you, especially little Sol. But you are right…she came to you, not by accident, but with a very special purpose - to find a forever home with puggies and humans who would cherish her and give her excellent care in the last half of her precious life. We all hope and pray for the best possible results and, believe me, Sol knows that she is in hands and paws that are loving, concerned, gentle and watchful. Hang in there precious Sol. We’re all pulling for you. So sorry to hear the news about your precious puggie. Hopefully because of her age, and the low grade tumor, she should be fine for the next few years. Hopefully everything will work out. Our thoughts are with you! I’m very sorry to hear this. I believe Sol made her way over to you to live out the rest of her days no matter how long that might be in a nice house filled with love. In my opinion, she is 12. If I were in your shoes I would make her comfortable and get the blood work done every six month. Please don’t feel like you are doing nothing for Sol, you have done alot for her and I’m sure she is eternally grateful for you and your family. Of course, I’m not in your shoes and it’s easy for me to say what I would do. I’m sending all my Pug Prayers your way. God bless Grammy too! Truly not the news you were wanting. We know all things happen for a reason, but sometimes the reason escapes us. Sol is having wonderful “sunshine” time with you and your group…we wish you all the best! It breaks my heart to hear this bad news, but just imagine where Sol would be today if she hadn’t found you. There is no one who could love or care for her the way that you do. And she definitely would not have the prayers coming her way like she does now. Prayers can work miracles, and from all the posts I’ve seen so far there are lots of them out here for little Sol! Oh I am so sorry! Not four weeks ago we found out our Rosie had a tumor on her chest. It was just aweful for us to think about, lots of tears in our house too. Poor girl had such a rough life then to have to get this news, I am sure you are feeling the same for Sol. (Our Rosie came from the evil breeder lady via CPR and she is also blind.) We were so blessed to learn that Rosie’s cancer was completely removed with the tumor and there is a 90% chance it will not return. Sol is most definitely in our prayers, we love her! Many Pugs and Kisses!!! I am so sorry to hear about Sol. I could not think of a better home for her to live her retired years. Everyone has an angel and I see her angel as being you. Many prayers sent her way for some good news on treatment. I can’t begin to express my heartfelt sorrow at learning of Sol’s cancer. I’m typing this through the fog of tears. If there’s anything good about this ordeal, it’s that she lives with a family that loves and cares for her dearly….and don’t forget her cyber family out here, too. Our hopes, prayers and well wishes are with you and Sol. We send her all the strength we can muster to pull through this and be healthy. Pug Hugs to you all! Awww, poor baby. My heart is with you, for both Sol and your mother. Even passed out and with her mouth bleeding, she’s still adorable… I hope she does well.